Unlike in the West, it's hard to make films on real-life historical events in India. Political pressures and sensitive groups invariably throw a spanner in the works. Which is why it's commendable what director Shoojit Sircar has undertaken with 'Madras Café'. Set in the late 80s and early 90s during the civil war in Sri Lanka, the film meshes fact and fiction competently to present a dramatized account of the real-life conspiracy behind the assassination of Rajiv Gandhi. There's a lot going on in this dense script (by Somnath Dey and Shubhendu Bhattacharya) which spends the first half hour or so of the film laying out the geopolitical history of the region and the times. Through voiceovers and occasionally confusing scenes, we're provided a background to the ethnic conflict in Sri Lanka, led by rebel group LTTE, who're referred to as LTF in this film. We're also told of the IPKF (or the Indian Peace Keeping Force) that was deployed to cool off the tension in Sri Lanka, but who got in the way of the LTTE. And we're introduced to Anna (Ajay Ratnam), head of the LTF, modelled so closely after LTTE chief Prabhakaran who famously masterminded that dastardly killing. 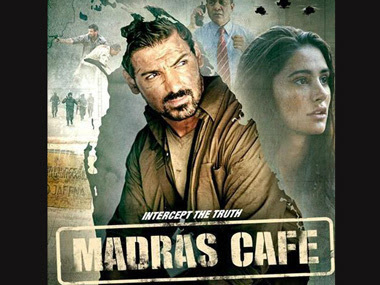 But the film's plot kicks in when military intelligence officer Vikram Singh (John Abraham) is dispatched to Jaffna on a covert mission to weaken Anna's stranglehold on the region. With the help of a British Asian journalist (Nargis Fakhri), Vikram uncovers a daring conspiracy involving foreign players and key figures in the Indian bureaucracy. Despite the crisp pacing, the film's first half will likely be a slog for anyone unfamiliar with the subcontinent's recent political history. It doesn't help that the writers stuff too much information into these portions, often digressing from the central assassination conspiracy, which remains the film's key strength. 'Madras Café' feels more surefooted in its second half when it slips into race-against-time thriller mode. The unfolding of the assassination plot, the decoding of crucial intel, and the chilling explosion itself is remarkably shot and edited, and leaves you shaken despite the inevitability of that climax. What feels clunky, however, is the framing device Sircar employs to tell his story. A grizzly Vikram narrates the events in flashback, thereby diluting the emotional impact of the terrifying assassination scene. Portions featuring Vikram and his wife slacken the pace, particularly one clumsily written love scene. But these are minor complaints in an otherwise slick film that gets so many things just right. Sircar avoids over-familiar faces in the film, and makes interesting casting choices across the board, particularly Siddhartha Basu in the part of R&AW chief Robin Dutt. John Abraham himself nicely slips into the skin of a committed officer tasked with protecting the nation, and he's particularly at ease in scenes where he's out there in the trenches facing the enemy, gun in hand. Even Nargis Fakhri is pleasantly competent as the strictly English-speaking reporter. Solidly directed by Sircar, who steers clear of typical Bollywood machismo and avoids oversimplifying characters or their motives, the film - at a little over two hours - is a compelling watch. I'm going with three-and-a-half out of five for 'Madras Café'. Until the climate is more conducive for filmmakers to boldly make real-life stories without fear of controversy or censorship, this may be the best way to approach important stories that must be told.